Yes, that is a negative amount you see below under Total Spent. I redeemed more gas points this week and since I hadn’t spend just a lot on groceries it ended up helping me out a lot! I don’t typically buy almond milk, but a while back Silk had a promotion on their Facebook page where you could sign up and get a coupon for a free product. So I of course did it theorizing that I could use it up in baked things here and there if nothing else. I really am not a fan of almond milk, so that is probably what I’ll do with this. You won’t believe how long I stood in the trash bag aisle trying to figure out if I should get these Glad trash bags! I knew that I still needed to buy about $9.50 worth of either Glad or Clorox products to earn the $5/$25 Saving Star rebate the was available. I had purchased about $14.50 worth of Clorox products several weeks ago and actually made money on them even without this rebate. So, that is what made it hard to figure out if the deal was worth it or not. $12.99 sounded like some pretty expensive trash bags and yet I knew the rebate would make them much cheaper. After doing a bit of math, I finally decided it was worth it, because basically I was getting the box of 50 trash bags for $7.99 after the $5 rebate. At Aldi, I can get 28 bags for $4.99, so while that is usually a far better price, in this case the Glad bags ended up being a bit cheaper, so I decided to go for it and get them. 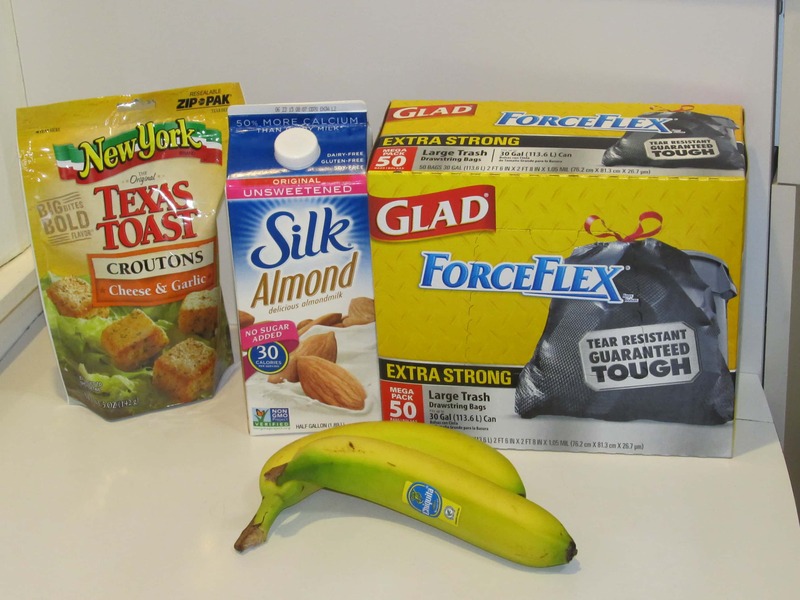 The bananas were all of $0.02 after two rebates. I love getting inexpensive fruit! 🙂 And the Texas Toast croutons were kind of an impulse buy. We love them and when I happened to see that they were on sale for $1.00 I decided to go ahead and get them. Some of you might be thinking, “Lady, you are crazy! It’s only a $1.00, so what’s the big deal?” And you are kind of right. But here’s the thing. It’s easy to get tricked into thinking that “it’s just $1.00” and forget that those $1.00 purchases here and there add up. 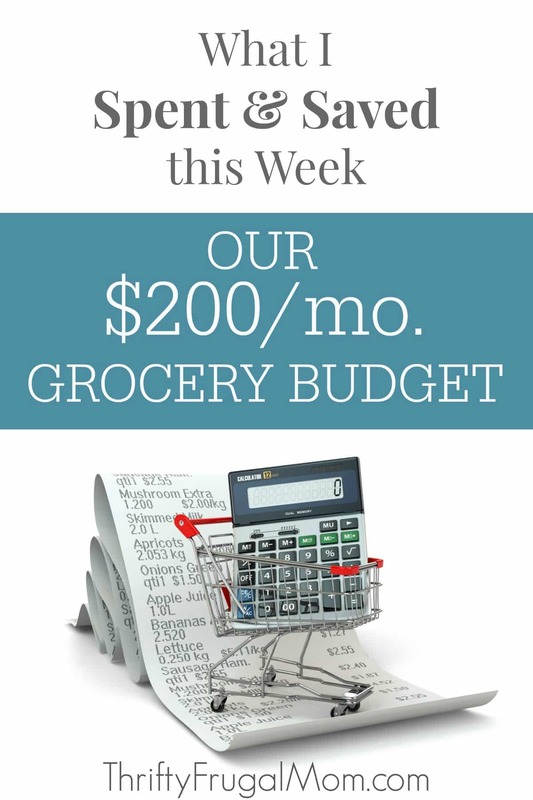 Being mindful even of little purchases and savings has helped me keep our budget this low. As of May 1st, we are officially a one car family. I wasn’t so sure about it and am not sure how well we’ll like it, but we really want to try it at least this summer since it will save us a lot of money in the long run. (Think insurance, tag/title/, registration etc.) It definitely helps that my husband is only working 3 days a week right now since he’s doing school part time from home. And he carpools with a co-worker about half the time too. I figured that I could put up with it at least for several months! 🙂 I’m pretty sure come fall we’ll have to go back to 2 vehicles since he’ll be doing school full time then, and I really don’t want to be stuck at home all the time! So, what does that have to do with groceries? Well, you may remember that we typically get our milk from a local dairy that my husband drives by on his way home from work. Since he will only be driving some of the time it’s going to make it a little harder to always get the milk when we need it, so we’ll probably have to occasionally supplement with bought milk. That is what happened this week. Neither of us thought about the fact that he wouldn’t be driving on Friday, the day he normally would have gotten more milk for us. 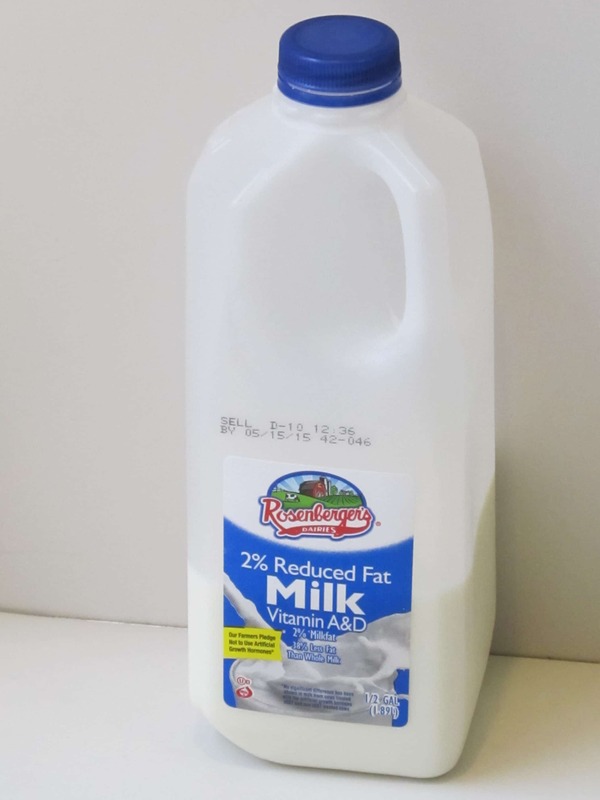 So he grabbed me this ½ gallon of milk to hold us over until today when he’ll be getting more from the farm. 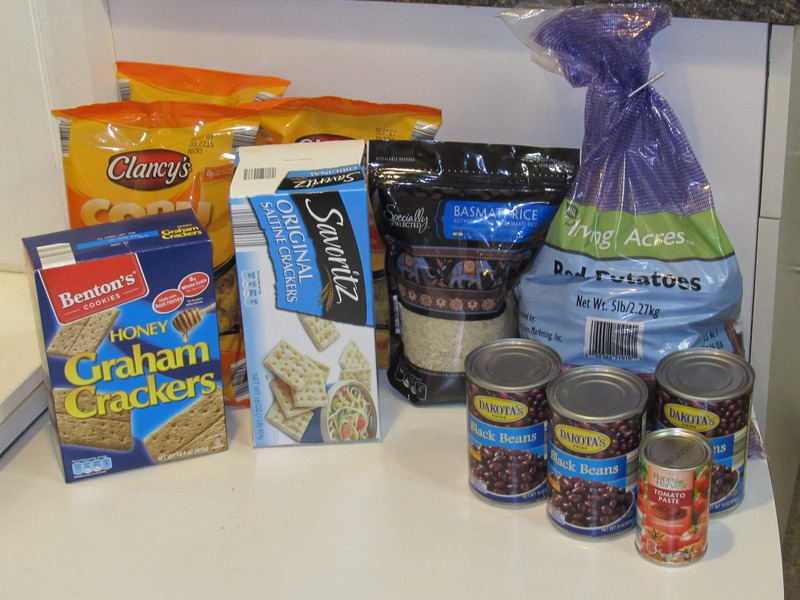 We served supper to the youth from church this past Sunday night- there were 35 to 40 people- and I realized that I didn’t have the corn chips that we needed, so of course I stopped by Aldi. And I can pretty much never go to Aldi and just get one thing. It seems there are always other things that I am needing too, so I got some of those things as well. I stopped by our local farmer’s market and got some fresh, locally grown lettuce and mushrooms. I love the lettuce that I get there. It’s beautiful and has a wonderful taste and texture. And while it is not marketed as organic, it basically is. 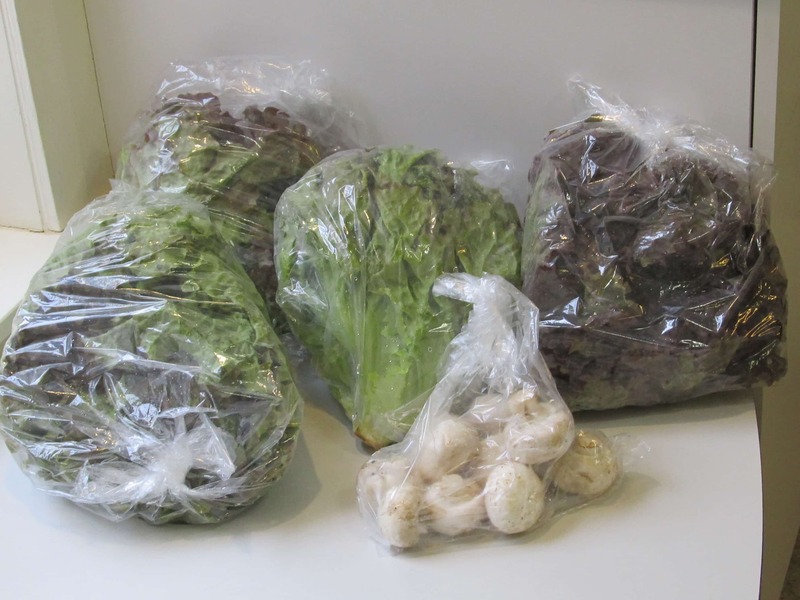 I used grocery cash to pay for this stuff, but I think the lettuce cost me $7.50 total and the the mushrooms are something like $1.50/lb. We provided supper for our youth group this past Sunday evening and so I used some of the lettuce for that, which is why I bought so much. I didn’t spend as much as I often do this month, mostly due to the fact that the deals weren’t as amazing as they often are. I also got a boost from 2 weeks where I redeemed gas rewards too! So I was able to end the month well under budget and am over $150 under budget for the year. That feels good because I’ll soon be purchasing large quantities of fruits and vegetables to preserve and that takes a big chunk out of my grocery budget of course! Just wanted to pop in to say how much I love reading these particular posts of yours! I love budgeting, and so of course I also love seeing other people's line by line budgets. It's a fascinating way to get a glimpse into how other people live, and sometimes I learn a thing or too. :) I'd not heard of Ibotta or Checkout 51 before reading your posts, so I'll have to check them out! Thanks, Rachel for taking the time to comment and give me feedback (that is so helpful to me)! Glad to know you enjoy them. I always love seeing what other people buy and how they do things to save money too, so when I write these posts up I try to come at them from the angle of, "What would I want to know or find interesting?" And yes, if you have a smartphone, definitely check out Ibotta and Checkout 51. Actually, Checkout 51 can be used from a computer too, which is nice because it allows more people to use it. Hey, question about the red potatoes. I know you switched to them because they are healthier and I'm interested in that, too. Do you ever eat them like you would a baked potato? If so, how do they turn out? We like to have loaded baked potatoes once in a while but I'm not sure how that would work on red potatoes. On another note, I love that Basmati rice! Also, I started getting a half gallon of Almond milk to supplement the gallon a week we buy, and have found that I'm actually preferring it over cow's milk. Isn't that odd? I use it for my iced coffee all the time. Also, it goes really well in a bowl of granola where the flavor is almost hidden. Have a great weekend! Haha, Lydia, I think my husband would agree with you. He loves the farm fresh whole milk, so I'll just be nutty (pun intended) over here by myself. Thanks for clarifying about the potatoes. Yes, reds do taste less starchy so I'll give them a try baked sometime. Well I certainly don't fault if you are nutty, Monica. :) And my husband doesn't mind almond milk as much as I do, but then he's not a big milk fan to begin with, so I think that make a difference.